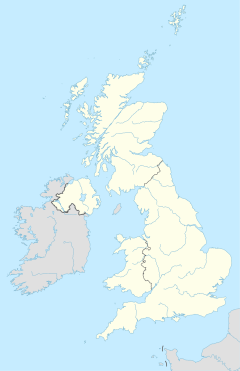 Killough (/kɪˈlɒx/ ki-LOKH; from Irish: Cill Locha, meaning "church of the loch") is a village and townland in County Down, Northern Ireland. It lies on the Irish Sea shore near Ardglass, five miles southeast of Downpatrick. It is notable for its sycamore-lined main street. In the 2001 Census it had a population of 845 people. In the 17th century Ulster ports began to rise in prominence. In 1625 William Pitt was appointed as Customer of the ports of Newcastle, Dundrum, Killough, Portaferry, Donaghadee, Bangor and Holywood. The village was originally known as St Anne's Port. The harbour was built in the 18th century by the Wards of Castle Ward house, just outside Strangford. A straight road still runs from Castle Ward to Killough. Killough was formerly in Rathmullan parish then transferred to Bright parish. The population in 1659 was 21. By 1821 it was 1,140 and in 1846 it was 1,148 with 224 houses, 51 families employed in agriculture; 126 in manufacturing or trade; 21 in professions; 118 in labouring jobs and 68 directing labour. In 1836 there was a Church of Ireland, two Methodist and a Catholic church. There were also some schools and an ancient well, St. Scordon's. The proprietor was Lord Bangor. Killough was full of bustling life in the 18th century. The village and port were the creation of Michael Ward of Castleward, the father of the first Lord Bangor and a justice of the King's Bench. From Norman times the Catholic Russell family held the manor of Killough, but they had been deprived of it after the rising of 1641. It was a place of little consequence, however, until Michael Ward turned his attention to it. He renamed it Port St. Anne, in honour of his wife, established a salt works and made a number of improvements to the harbour. The principal trade was the export of barley with fifteen ships and twenty boats engaged in fishing. After the outbreak of war between Great Britain and France in 1793 the growing of cereals increased in Lecale and Killough, as one of the ports of export, expanded to deal with it, until its population was almost double what it is today. The existing harbour facilities were soon inadequate and between 1821 and 1824, Michael Ward's son, the first Lord Bangor, employed the engineer Alexander Nimmo, to build new quays at a cost of £17,000. The piers, a long one of nearly 600 ft on the Killough side and a short one of 100 ft on the Coney Island side, enclosed a fine harbour. The village prospered and the grain merchants built their imposing houses in Castle Street, and their stores on the narrow lane leading to the quays. For a brief period in the early 19th century, Killough was the busiest of the seaside villages of East Down and with its tree-lined main street, in many ways the most attractive. But when the post-war depression of the 1830s brought a fall in grain prices, merchants who had expanded in many fields during the inflationary period, soon found themselves in difficulty. For a time their reserves enabled them to keep going, but soon Killough saw one grain store after another close and its once busy harbour lay idle. The decline of the village was reflected in the population which fell from 951 in 1851 to 380 in 1937. St John's Point lighthouse and ancient church are close to Killough. St Johns Church"" This chapel was erected in 1828 with money donated by a merchant named Mr Rogan. Prior to this Catholics worshipped at a Mass Rock near Conaimstown. The parish priest at the time was Rev. Father Richard McMullan. The church was consecrated by Dr Crolly in August 1828. In 1836 it was described as a plain building capable of seating 400 people. In 1844 the chapel was altered and it was rebuilt in 1884 after the brutal killing of 2 woman in the inside of the church. St Anne's Church This Chapel of Ease was rebuilt in 1716, again rebuilt in 1738 and again in 1815. This was paid for from a bequest of Rev. James Hamilton. Rev. Robert Stewart was rector for 40 years until his death in 1812. Rev. Francis McGillacuddy was rector in 1830. Rev. William Milligan died on 7 August 1832. His wife and two children also died in 1832. It was described in 1836 as a neat building with a belfry and spire and one small gallery. It seats 250 people and the spire was blown down and the roof damaged on the night of a big storm on 12 January 1839. The Rev. Horatio Moffat was appointed curate on 28 October 1845. Rev. J.W. Williams was rector in 1877, Rev. J. O'Flaherty in 1910 and Rev. R. Frazer in 1937. St. Joseph's Primary School is located on Main Street. Killough was used as one of 133 filming locations for the 2008 Kari Skogland film Fifty Dead Men Walking. Killough was used as the main Irish filming location for The Shore, an Academy Award winning short film about a man who emigrated to America to escape the Troubles bringing his daughter back to Northern Ireland to meet his childhood friends. The 30-minute film was shot entirely on location in Killough. Scenes from Terry George's 2011 film Whole Lotta Sole starring Brendan Fraser and Martin McCann were shot on location in the village, using Killough's harbour and beaches for many of the exterior shots. The village is the inspiration for the book Sweet Killough, Let Go Your Anchor by Irish politician Maurice Hayes, taken from the publication of the same name. Charles William Russell (1812–1880), priest and scholar. ^ O'Sullivan, Aidan; Breen, Colin (2007). Maritime Ireland. An Archaeology of Coastal Communities. Stroud: Tempus. p. 211. ISBN 978-0-7524-2509-2. Wikimedia Commons has media related to Killough.